Hummingbirds are a line of flat top acoustic guitars introduced by Gibson Guitar Corporation in 1960. Production continues today. The guitar is popular among folk, country and rock artists and is known for its warm tone and distinctive fretboard design incorporating bird and flower engravings. Vintage models from the 1960s are sought after and can be quite valuable. Hummingbirds were Gibson's first square-shoulder dreadnought style model. Over time, changes were made to the materials and methods used to make the guitar. Today, Gibson has gone back to producing the guitar to the same specifications as the original 1960 version, though some materials have changed. For example, Gibson notes on its website that rosewood from Madagascar is used in today's guitars instead of endangered Brazilian rosewood. According to Gibson, Keith Richards, Marc Bolan, Sheryl Crow, John McLaughlin, Jimmy Page and Gram Parsons are among the well-known musicians who have made extensive use of Hummingbirds. 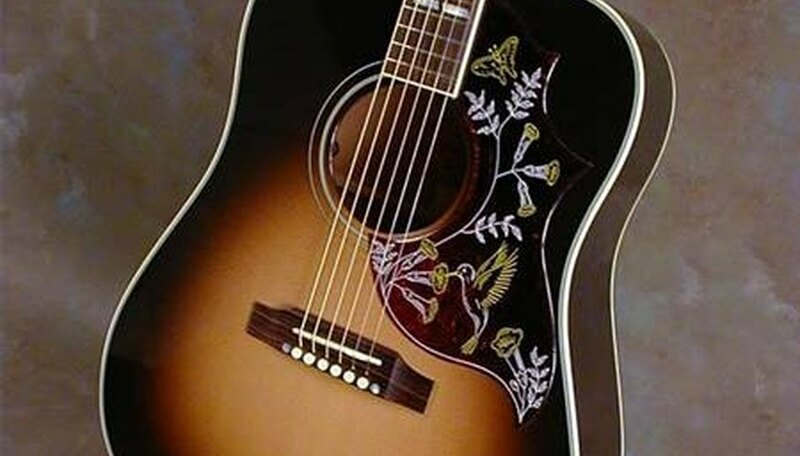 A new Gibson Hummingbird guitar has a manufacturer suggested retail price (MSRP) of $3,784. The True Vintage model, an exact re-creation of the original 1960 model with period parts and construction methods, has an MSRP of $5,007. Many retailers, such as Guitar Center or Sam Ash, will sell a new Hummingbird for hundreds of dollars less. According to Vintage-Guitars.blogspot.com, in 2007, a Hummingbird from the early 1960s was valued at anywhere from $4,200 to $4,700. A mid- to late-1960s model could fetch anywhere from $2,500 to $4,200. Hummingbirds made after 1969 are generally worth less, often under $2,000. The value of the guitar depends on a number of factors. Aside from the year it was produced, the condition of the guitar and whether it still has all its original components (or how many have been replaced) are important considerations. Hummingbirds made with rosewood are worth more than later models that used maple. A subsidiary of Gibson, Epiphone, also makes a version of the Hummingbird. Although these guitars also feature the Gibson name, they are worth considerably less money. Krikor Daglian is a freelance writer and muscian based in New York City. He has written about New York for the "Not For Tourists Guide" and on technology and online marketing for eMarketer. He is a native of New Jersey and a graduate of Colby College.